The latest advances in instrumentation, sample-preparation techniques, and innovative technologies and hybrid applications were among the topics covered at the recent ASMS annual meeting in Denver. Scientists from the University of Washington (Seattle) and New Objective discussed their use of a nanoLC-MS system to separate and ionize peptides and fragment, and isolate the ions to perform shotgun proteomics. The aim was to evaluate different column and gradient lengths on peak capacity, peptide identification, and suppression. Edward Hsieh, post doc in the department of genome sciences at the University of Washington, described the advantages of using splitless nanoflow chromatography for separating complex peptide mixtures and the rationale behind the selection of unique peptide identifications and peak capacity as the variables for comparing outcomes when varying column and gradient lengths. Hsieh noted the large amount of variability in the literature regarding these two chromatographic parameters, and his group hypothesized that longer columns would perform better. The Picofrit columns from New Objective used in the study ranged in length from 10 to 60 cm. The researchers used a nanoAcquity HPLC system (Waters) and a Thermo LTQ-FT Ultra (Thermo Fisher Scientific). Each sample comprised 1 µg of C. elegans lysate and bovine serum albumin. Each study run compared four column lengths, three gradient lengths for each column length, and three analytical replicates for each of those combinations. The researchers found that peak capacity increased linearly with column length, but there was not a similar correlation with unique peptide identifications. They hypothesized that the MS scan speed might not have been fast enough to take advantage of the enhanced chromatograph separation. While the number of unique peptide identifications increased as column and gradient length increased, this was true only up to a point. For example, the 60 cm column showed little to no improvement over the 40 cm column; the 10 cm column run showed little improvement when going from a 60 to 90 minute gradient length versus from 30 to 60 minutes; and the 30 minute gradient run showed no improvement beyond a 10 cm column length. Kenneth Lewis, Ph.D., CEO of OpAns, also presented work done in collaboration with New Objective. He described methods for steroid analysis using nanospray MS as “a work in progress.” The main advantage is the ability to use small sample volumes, which is particularly beneficial when working with pediatric samples or for serial sampling from small animal models such as mice. This requires high sensitivity in the pg/mL range. Dr. Lewis’s group used the Agilent 1200 SL liquid chromatograph coupled to an Agilent 6410 triple quadrupole HotBox mass spectrometer run in electrospray ionization (ESI) mode. They added an online automatic splitter from Analytical Scientific Instruments, which determines the high and low flow rates and automatically adjusts the flow to maintain the desired rate. Although nanospray steroid assays are not yet better than conventional assays, they are improving, Dr. Lewis concluded. He described the nanospray technology they employed as robust and easy to use, with good sensitivity and about a 10-minute injection-to-injection interval. Reid Brennen, a scientist from Agilent Technologies said that microfluidic devices for LC-MS applications provide low dispersion and minimize sample loss and can be readily integrated with a nano-LC column with an ESI contact. The microfluidic chips he described are stackable, with each layer providing additional functionality. He cited several benefits of microfluidics for LC-MS, including the potential for increased complexity and integrated workflows, reduced sample and media volumes, higher throughput, and shorter run times. One challenge in designing the chips was the need for higher pressures and stronger materials to support larger columns. In 2010, Agilent developed a multilayer metal technology that made it possible to bond together metal chips. The company uses electrochemical etching to create ports, an LC column and various types of channels, transfer channels, frits, and an enrichment column/sample loop, for example. 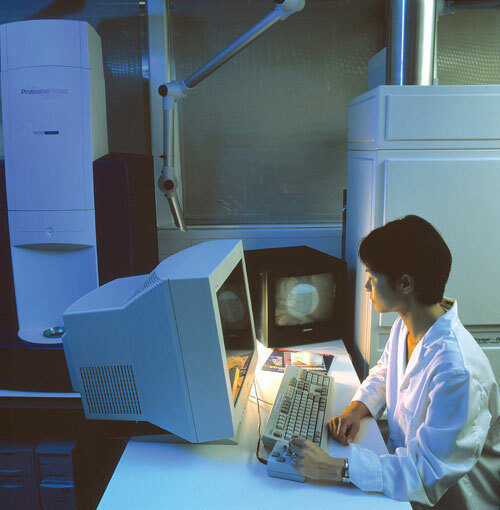 The system now in development comprises an Agilent 1200 LC system, a modified Agilent 4240 Chip Cube, an Agilent 6520 Q-TOF MS, and the experimental metal chip devices. In his talk, Brennen described the analysis of a BSA digest using this system and reported good or better sequence coverage as compared to a polyimide chip, without loss of peptides. Jinyuan Wang and William Schnute, scientists at Dionex, talked about their use of capillary ion chromatography mass spectrometry (IC-MS). Classic capillary ion chromatography is complementary to reverse-phase LC, is carried out in capillary tubes, and is incompatible with MS analysis. Wang described the use of an eluant generator, which electrolytically generates an ultrapure, reproducible mobile phase. A suppressor converts the mobile phase to deonized (DI) water, making it compatible with ESI-MS analysis. Wang emphasized the importance of optimizing the ESI source parameters for the particular application, including the ESI probe depth, ESI voltage, and proximity of the spray tip to the MS. Modifying the gauge of the capillary and use of a desolvation solvent can greatly improve the sensitivity of the system. Andrew Chambers and colleagues from University of North Carolina, Chapel Hill, described an integrated microfluidic capillary electrophoresis-MS method using dataindependent multiplexed fragmentation to perform high-throughput proteomics. The technique could be applied to a bottom-up proteomic approach and for characterization of protein-based biotherapeutics, for example. The capillary electrophoresis device is 42 cm long, with an MS port located at one corner through which a sample is sprayed into a Q-TOF mass spectrometer. The flow rate of the system is 18 nm/min, reported Chambers, and it is possible to deliver overlapping injections into the capillary electrophoresis device at injection intervals of three minutes. Injecting a second aliquot of the same or a different sample before the previous sample is delivered to the MS did not result in sample carryover from run to run. Microfluidic CE-MSE of a tryptic digest using the Waters SYNAPT G2 yielded a peak capacity of about 70, with about 12 points/peak in a 40 millisecond scan time, generating sufficient data for peptide identification. The researchers compared three runs each of CE-MSE and LC-MSE. The former identified 136 peptides and the latter 141, with an overlap of 120 peptides. “In the future we want to integrate onchip sample cleanup and preconcentration to minimize sample waste” and incorporate quantitative analysis, said Chambers. Rawi Ramautar and colleagues from Leiden University Medical Center, in collaboration with Beckman Coulter talked about how changing levels of low molecular weight metabolites present in biological fluids may closely associate with phenotype. The large diversity and dynamic range of these metabolites makes it difficult to use a single technique for global metabolome analysis. Ramautar’s group chose capillary electrophoresis, a charge-based separation technique, because metabolites present in body fluids tend to be highly polar and ionogenic. The method is fast and efficient, requires minimal sample preparation, and incorporates in-capillary sample preconcentration, according to Ramautar. Beckman designed its CESI (capillary electrophoresis nano-ESI)-MS system with a sheathless interface. The researchers compared urine profiling with CE-MS performed on 8-nL sample injections using either a sheathed or sheathless liquid interface. They showed that the limits of detection (LOD) were at least 10- to 30- fold better with the sheathless approach, and it yielded many more molecular features of the urinary metabolites. They reported an LOD range of 11–115 nmol and a dynamic range of two to three orders of magnitude with a sheathless interface. “Nanoflow separation technologies are increasing the speed and precision with which we can validate biomarkers,” says Ian Pike, Ph.D., COO of Proteome Sciences. The company performs protein biomarker discovery, validation, and mass spec-based assay development and has introduced commercial assays for Alzheimer’s disease. “MS-based biomarker validation is transforming the potential for clinical applications of biomarkers,” Dr. Pike added. It is now possible to analyze a peptide panel against a plasma sample in about 20 minutes, and “we would like to reduce that to less than 10 minutes” in a format that would be amenable to on-site testing in a physician’s office. Proteome Sciences, in collaboration with Thermo Fisher Scientific, developed isobaric tagging technology in Tandem Mass Tags (TMT®) that allows users to assay up to six samples per run on the Thermo Orbitrap Velos mass spectrometry system. In addition to providing multiplexing capabilities, the technology enhances the ability to measure peptide isoforms and to differentiate posttranslational modifications. Proteome Sciences recently announced that it was selected to participate in the new “Denamic” project to develop tools and methods to monitor the neurotoxic effects of environmental pollutants that may adversely affect cognitive skills and cause developmental disorders in children. The project will be funded by a European Union Framework 7 grant. The study will involve mass spectrometric analysis of TMT-labeled peptides, which will form the basis for the development of biomarker assays.